Coding is the most important job of the future. I’ve seen this headline (and similar) many times over the past years. Coding is a skill that now bridges many different fields and career paths, from IT to art careers. Basically, coding is a worthwhile venture. Now pair that with kids who love all things technological and it’s a winning combo! But how do you teach kids to code? More specifically, how do you teach your kids to code when you don’t know how to code yourself? To start with, it’s never too early to start teaching basic coding skills. Coding involves using computer language. But unlike speaking English, computers don’t extrapolate information. They do exactly what you tell them to do. If you tell them to turn right, they turn right. If you tell them to stop, they stop. Teaching young kids how computers think, on a very basic level, will give them a leg up later. And the best way to teach young kids about anything is with toys and free play. So I was really excited to find Cubetto – the coding robot from Primo Toys. Not only is Cubetto really cute, but the toy opens up so many opportunities for playing with coding. How do you start teaching young kids to code? If you can start when they’re really young – like toddlers and preschoolers and up, start with coding toys like Cubetto! Cubetto introduces kids to the concepts of coding language, coding algorithms, and setting up a queue to be executed. That sounds like a lot for one toy that doesn’t even have a screen, but it’s true! First, Cubetto moves based on what we tell him to do. There are little red, yellow, and green tiles that indicate whether he should turn right, turn left, or go forward. These are the basics of coding language. Simple commands that are followed precisely. Second, the blue tile. This is the ‘function’ tile. A function sets up a sequence to be followed by one simply code. So instead of repeating ‘turn right, go forward, turn right, go forward’ multiple times, you can set up a function. In Cubetto, the function area is the bottom 4 spots. In this photo they are all green tiles. When Cubetto gets to the blue tile in the sequence, it will execute the function. In this case, he will move forward four times in a row. Cubetto also introduces the concept of a queue. 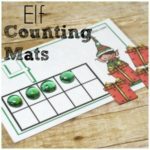 Kids can fill up the entire sequence with tiles for Cubetto to perform. Once the button is pushing, Cubetto will move through each tile in turn. Kids can see that when they code, the code will be executed like a queue. My favorite part of the Cubetto is that learning how to code with it is intuitive. By playing with the set and inputting different blocks, they figured out what each piece did. They were able to manipulate what was happening (often working as one team). My kids did not want to bother with reading the instructions. But that was okay because they were able to figure out what to do by trial and error. In fact, it was quite easy to work out how to use Cubetto and figure out what each piece does! I think learning through play is one of the most effective methods, especially when it comes to young kids. So a coding tool where they learn how to use it through play is just perfect. Can toddlers and preschoolers learn coding and programming? Yes! 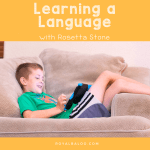 I mean, you’re probably not going to have a 3-year-old designing websites or video games from scratch, but young kids can absolutely learn coding skills! 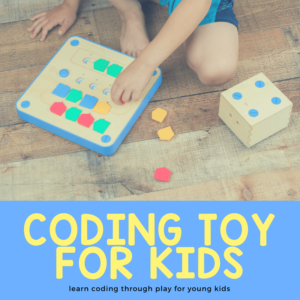 There are coding toys – like Cubetto – coding games, and coding crafts!